THE BOOK LOUNGE in Cape Town was filled to the brim with cartoonists and appreciators of their art for the launch of DON'T JOKE! The Year in Cartoons, a collection of almost 400 cartoons chronicling the past year in the life of South Africa's young democracy. And what a year it's been! NEW INK: Meet South Africa's exciting new cartoon talent in CT tonight! Cartoonists BRANDAN, SIWELA, MGOBHOZI & JERM will present their work TONIGHT in Cape Town, and you're invited! Incisive wit combined with skilled technique - a lethal combination and essential prerequisite for successful political cartooning. 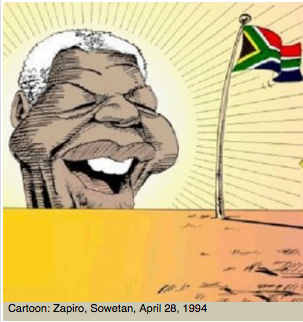 Some of South Africa’s best political cartoonists presented their takes on reality and cartooning history at the Iziko South African National Gallery Annexe in July and August. The Centre for Comic, Illustrative and Book Arts (CCIBA) is hosting a hands-on interactive workshop with Cape Town’s top cartoonists at the Izeko Museum in the Company Gardens in Cape Town this weekend. ZAPIRO SWEEPS MONDI NEWSPAPER AWARDS (AGAIN)!